Boss Chris Wilder vowed to keep his cool after Sheffield United’s automatic promotion hopes suffered a blow at Birmingham City. The Blades were forced to settle for a 1-1 draw at St Andrew’s as they missed the chance to climb back into the Championship’s top two. Blues captain Michael Morrison cancelled out Enda Stevens’ opener to leave United third, a point behind Leeds with five games left. United are seven points adrift of leaders Norwich, who drew 2-2 with Reading, after another twist in the race for the Premier League. Wilder said: “You guys will talk about it, the fans will talk about it but I won’t. I will just talk about the accumulation of points. I can’t be a rollercoaster myself. “We have to keep nice and calm, we have some fabulous games ahead. It’s not want we wanted tonight but the players shouldn’t feel down about it. They went for the win in the second half. Stevens netted his first goal of the season when he drilled through Lee Camp’s dive eight minutes before the break. But four minutes later Morrison stabbed in after Gary Gardner’s header was blocked. 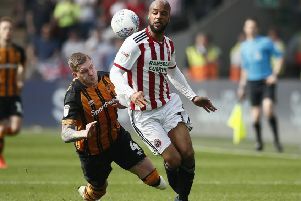 Dean Henderson saved well from Che Adams and Jota but David McGoldrick nearly won it for United only to head over late on. Birmingham remain 17th, after a nine-point deduction for breaching profitability and sustainability rules, but have taken four points from Leeds and Sheffield United in their last two games. You guys will talk about it, the fans will talk about it but I won’t. I will just talk about the accumulation of points. I can’t be a rollercoaster myself. “To take four points was huge in terms of where we need to get to,” said boss Garry Monk with Birmingham six points above the bottom three. “Coming off the back of five losses to take four points is huge for the players. “It’s probably a fair result but we had the best chances. We showed resilience and character coming off a big performance at the weekend.